Fishing Doesn’t Need to be Scary! For many, fishing just comes naturally. We don’t even think twice when the phone rings, asking if we want to go fishing. It’s easy. We just grab our gear and head out the door. But what if you have never fished before? How do you even know where to start to learn about how to fish, much less what kind of gear you would need to buy? Next time you’re in your favorite store loading up on the tried-and-true flasher, or lure, take a step back and picture yourself as a new angler. How could anyone even know where to start? You probably don’t even notice that there are literally hundreds, if not thousands of lures, hook types and sizes, artificial baits, rods, and reels just hanging on the racks. It can be overwhelming. Check out our wefishak webpage! Think of this as your one-stop place to learn about sport fishing. 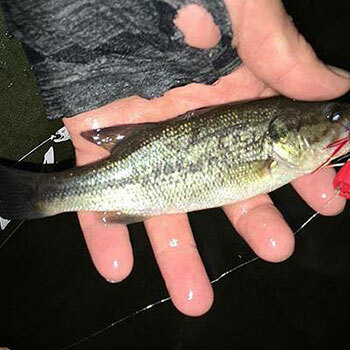 On the page we’ve provided information on where to fish, especially on stocked waters, and we’ll even loan you fishing gear, so you can decide if fishing is something you want to do. You’ll find how-to videos, links to our regulation summary books, and even encourage you and your family to take a fishing challenge, that once completed, will provide you and your family with a certificate of accomplishment. Fishing is fun! And, as a bonus, it can provide food for dinner. Before your next trip, think about someone you know who might not have tried fishing. Give them a call! You might have found a new fishing buddy. And, you can show them that fishing is not scary! They arrive in our world powerful, vibrant and alive, an envy of muscle tone and fitness, a life epic in its endurance and distance travelled. The changes are subtle at first, then startling, and finally grotesque. Their bodies change into unique colors, some develop a hump on their backs, or a hook to their jaws. 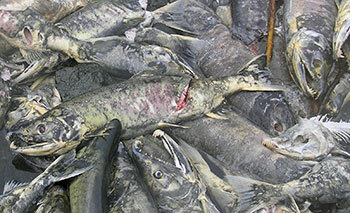 Then, their eyes cloud over, their skin sloughs off, their fins and tails become abraded to bloody stumps. But they keep going, they keep coming, with only one obsession: spawn, SPAwn, SPAWN! This annual zombie offensive culminates in October with late humpback pinks, snaggle-toothed tiger chums and burnt red coho salmon. Stemming this tide, the apocalypse is beaten back, subdued until even the defenders are sated, satisfied, and exhausted. Bald eagles and ravens peck out their zombie eyes, black and brown bears bite their brains, rainbow and cutthroat trout devour their spewing eggs, Coast range sculpins and Dolly Varden char tear their sloughing flesh. Their twitching, half-dead, dead, and dying bodies pile up, feeding terrestrial maggots and aquatic insects. Bacteria, protozoans, and fungal hyphae mine the last remaining lipids, proteins and nutrients back into a sustaining soup of a different kind. Disassembling and transfiguring the raw materials of death into new and unique forms of life. So, go out to the fall salmon streams to witness this spectacle, to cheer the defenders, to experience the cycle of energy from zombie to renewed life to the swimming dead again. Ponder on those basic building blocks of marine-derived nutrients comprised of zooplankton, jellyfish, armhook squid, and Pacific herring that were transported from across the North Pacific to grow new fish, birds, mammals and even the trees of our riparian forests. Life energy that is neither created or destroyed but transformed. And in their zombie wake, the invaders leave behind the next generation, buried in the gravels, awaiting to rise again. Spawned from the dead, in a few years these alevins, fry and smolt will once again return to haunt the streams of October. David Love is an Assistant Area Management Fisheries Biologist based in Douglas, AK. 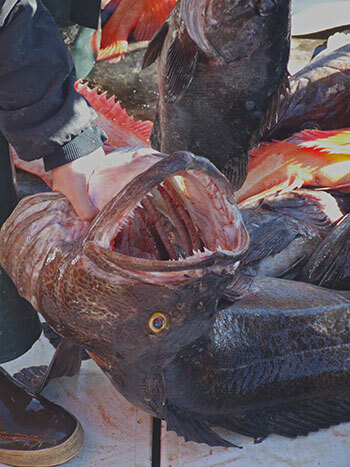 Do Sport Fishing Regulations Scare You? Regulations should not scare you away from fishing in fear that you will get caught doing something wrong! 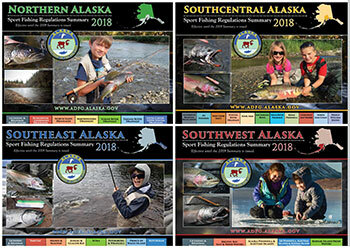 The Division of Sport Fish frequently hears that Alaska’s fishing regulations are complex and that our anglers find them difficult to understand, and sometimes might even keep them from enjoying a day on the water. In response, the division has been exploring ways to make fishing regulations easier to access, understand and comply with. We recently contracted with DJ Case & Associates to conduct a survey of resident and non-resident anglers to determine how sport fishing regulations can be made readily accessible and easier to understand. Participants were randomly selected, and nearly 4,000 anglers responded to the online survey. If you are an angler who took the time to respond to the survey, thank you for providing us valuable feedback on how to serve you better! After reviewing the survey results, the Division of Sport Fish has committed to exploring the development of a mobile app over the coming months. We hope to display regulations, and any emergency orders in effect, at an angler’s current location and any location they may want to fish. The division is also considering new ways to present regulations through our website and social media platforms, as well as improving how we communicate information through our existing Sport Fish Regulation Summary Booklets. The survey report, including recommendations from DJ Case & Associates, can be found in its entirety on the department website. Check Out These Local Fishing Spots! When the weather cools in September and October, the headwater glacier melt slows to a trickle, the river water level drops, and the water clears of silt. This makes for good fishing in glacier-fed rivers like the Chilkat and the Chilkoot Rivers because the fish can see the lure. The Haines area weather in fall 2018 has been extraordinarily sunny and rain-free. But since Haines weather can be unpredictable, it’s always a good move to check the National Weather Service’s online graph of the recent Chilkat River water level and their 3-day forecast is very helpful for planning a fishing trip. Coho salmon counts in the lower Chilkat River fish wheels have been strong in September 2018, and a large pulse of coho salmon passed upstream through the Chilkoot River weir before the weir was removed. Anglers have reported good catch rates in both rivers. Roads run alongside both the Chilkat and Chilkoot Rivers, so there is a wide selection of fishing access points, from the tideline as far as 26 miles up the Chilkat River. Bait is allowed in Chilkoot River and Chilkoot Lake. Bait is allowed in the Chilkat River drainage, except not it Chilkat Lake or Mosquito Lake. The coho salmon bag limit is 2 fish per day, 2 in possession on the Chilkoot River and 3 fish per day, 6 in possession on the Chilkat River. 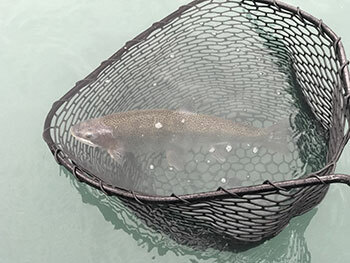 Anglers are reminded that if they catch their daily bag limit of 3 coho salmon on the Chilkat River, they cannot retain any coho salmon on the Chilkoot River on that same day. The colder temps and darker days of October are the perfect time to hit up local lakes throughout Southcentral Alaska. Resident species are actively feeding before the lakes start to freeze up. It won’t be too long before you are going to need to layer up in winter gear and drill through the ice for some hardwater fishing. Tired of your same old local fishing lakes? Take a few minutes to review the ADF&G Lake Fishing Information webpage for lists of stocked and wild lakes through Southcentral Alaska. This webpage provides anglers with useful information such as directions to the lakes, bathymetric maps, and the types of species that are present in the lakes. For Anchorage lakes, anglers can review a stocked lake booklet tailored to the Anchorage area. Your local lakes are not the only location where fishing is still going strong. Local rivers are still producing decent catches of fish! Pulses of dime-bright coho salmon continue to be caught while fishing on the Kenai Peninsula. 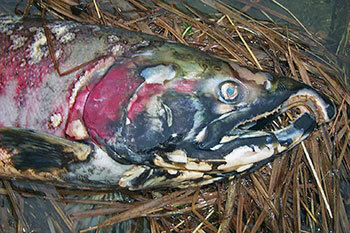 Coho salmon are a finnicky species and will continue to trickle in throughout these colder months. However, the real beauties of colder weather fishing are the bright bold colors of rainbow trout and Dolly Varden. Fishing for these species has been amazing on rivers and streams through Southcentral Alaska. Anglers have found success fishing with beads from the river banks or drifting on the Kenai River. Popular areas for drifting down are from Jim’s and Bing’s Landing. Anglers have also found success walking the Russian River and its confluence area. If you have always wanted to give fly fishing a try but have been hesitant, there is no time like the present. There is nothing like hooking rainbow trout or coho salmon on a fly rod. It’s an entirely different experience from a spinning rod and with each fish, you learn the art of give and take on a fly rod. 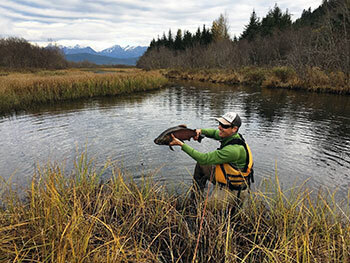 The Anchorage ADF&G office, at 333 Raspberry Road, offers a “try-before-you-buy” rod loaner program that allows anglers with a valid fishing license to check out a fly rod for a limited amount of time. However, it won’t be too long before you are hooked and will be investing in a new fly rod and filling another tackle box with countless beads and dry flies. Cushman Lake is located in the Tanana Lakes Recreation Area just minutes from downtown Fairbanks. The lake is stocked with rainbow trout and has naturally occurring northern pike. Non-motorized boating is permitted. The recreation area has a swim beach with sandy shore and a picnic area. Looking for an out of the way fishing destination? Coal Mine #5 Pond is a small, five-acre, stocked lake in the foothills of the Alaska Range. You can access Coal Mine #5 via the Coal Mine Road at mile 242.1 Richardson Highway, 24 miles south of Delta Junction. Coal Mine Road is not passable by standard automobile and requires the ground clearance of a truck or SUV. Coal Mine #5 is stocked with rainbow trout. Several other lakes off Coal Mine Road are also stocked with either rainbow trout, Arctic char, Arctic grayling, or Chinook salmon. During the summer/fall months, many users drive the Coal Mine Road to within ½ mile of the pond, but you cannot drive all the way in a highway vehicle. The road is not plowed in winter, so users normally access Coal Mine #5 Pond by snowmachine, from a parking area off the Richardson Highway. An Alaska Department of Fish and Game public-use cabin is located on Coal Mine #5, which can be reserved by calling 907-459-7228. It’s not a trick when someone comes to your door with a plate of smoked salmon. Check out this treat of a delicious way to serve your favorite smoked salmon from our friends at the Alaska Seafood Marketing Institute.